In the post-industrial economy, multinational companies only own the brand and develop the image and philosophy behind the product. Manufacturing is entirely outsourced to partner companies and licenceholders that eventually sell the finished product to the main company at very low prices. Bringing such a behaviour to its extremes, companies are able to outsource every aspect of their production to independent workers and make a larger marge of profit even on the immaterial aspects of work. From marketing to product design and developement, interior design and engineering, the companies do not need any longer to hire personnel but they rather have the tasks done by a vast mass of subjects working flexibly from home on specific projects. For the immaterial worker the boundaries between life and work are getting completely faded, his work coinciding with his life. Neverending work becomes a moral obligation, a pre-determined path to self improvement as well as a self defense from the social exclusion by unemployment. 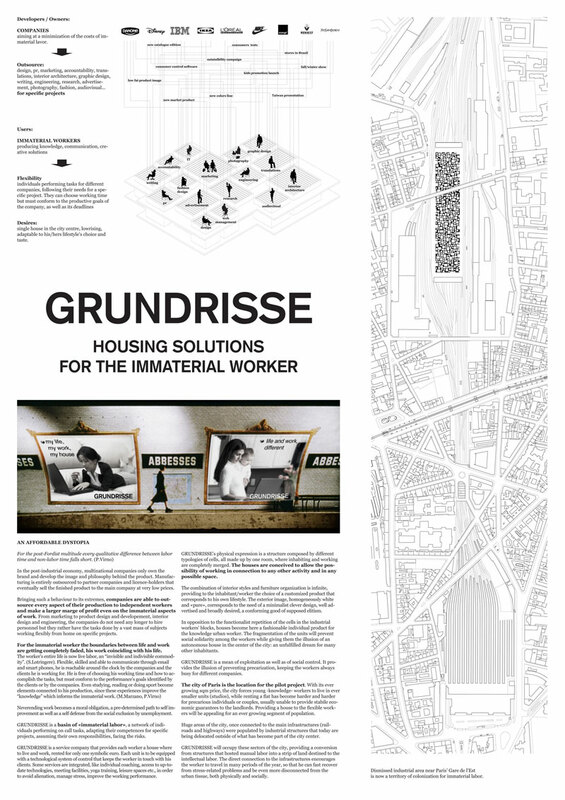 GRUNDRISSE is a basin of «immaterial labor», a network of individuals performing on call tasks, adapting their competences for specific projects, assuming their own responsibilities, facing the risks. 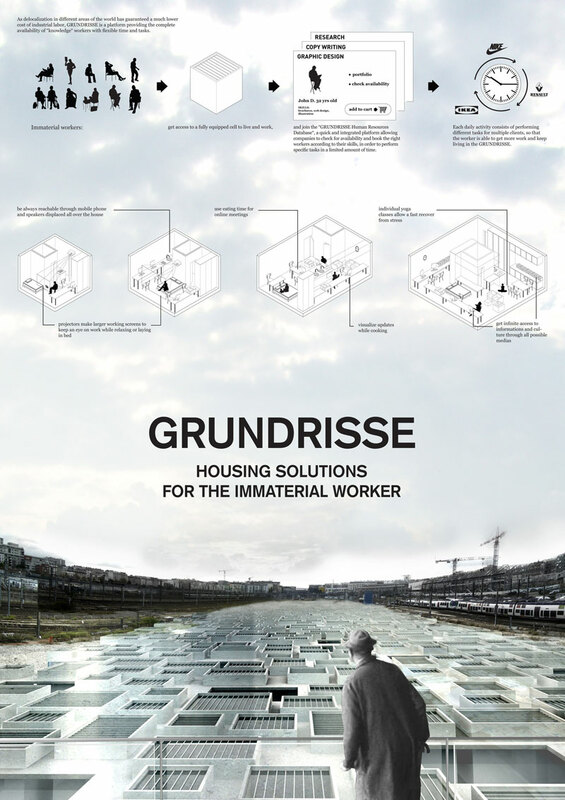 GRUNDRISSE is a service company that provides each worker a house where to live and work, rented for only one symbolic euro. Each unit is to be equipped with a technological system of control that keeps the worker in touch with his clients. Some services are integrated, like individual coaching, access to up-to-date technologies, meeting facilities, yoga training, leisure spaces etc., in order to avoid alienation, manage stress, improve the working performance. 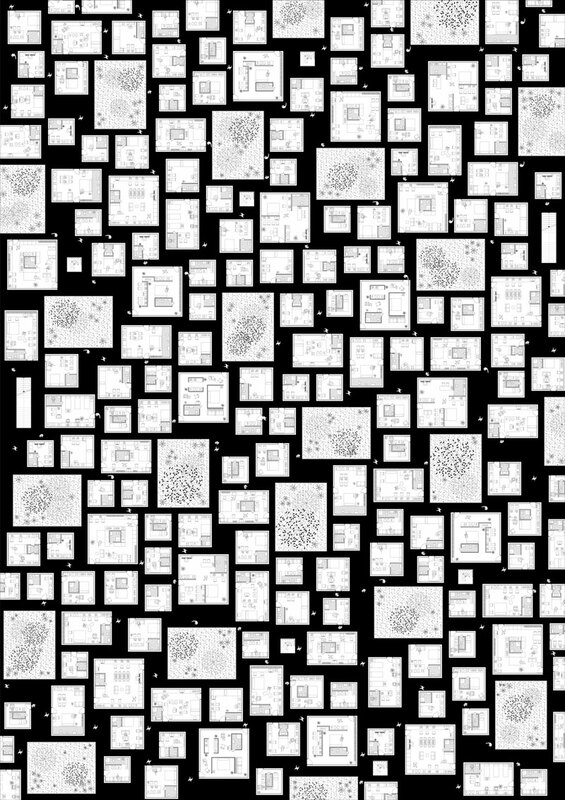 GRUNDRISSE’s physical expression is a structure composed by different typologies of cells, all made up by one room, where inhabiting and working are completely merged. The houses are conceived to allow the possibility of working in connection to any other activity and in any possible space. The combination of interior styles and furniture organization is infinite, providing to the inhabitant/worker the choice of a customized product that corresponds to his own lifestyle. The exterior image, homogeneously white and «pure», corresponds to the need of a minimalist clever design, well advertised and broadly desired, a conforming good of supposed elitism. In opposition to the functionalist repetition of the cells in the industrial workers’ blocks, houses become here a fashionable individual product for the knowledge urban worker. The fragmentation of the units will prevent social solidarity among the workers while giving them the illusion of an autonomous house in the center of the city: an unfulfilled dream for many other inhabitants. GRUNDRISSE is a mean of exploitation as well as of social control. It provides the illusion of preventing precarization, keeping the workers always busy for different companies. The city of Paris is the location for the pilot project. With its ever growing sqm price, the city forces young -knowledge- workers to live in ever smaller units (studios), while renting a flat has become harder and harder for precarious individuals or couples, usually unable to provide stabile economic guarantees to the landlords. Providing a house to the flexible workers will be appealing for an ever growing segment of population. Huge areas of the city, once connected to the main infrastructures (railroads and highways) were populated by industrial structures that today are being delocated outside of what has become part of the city center. GRUNDRISSE will occupy these sectors of the city, providing a conversion from structures that hosted manual labor into a strip of land destined to the intellectual labor. The direct connection to the infrastructures encourages the worker to travel in many periods of the year, so that he can fast recover from stress-related problems and be even more disconnected from the urban tissue, both physically and socially. More details on Think Space | Moral borders site.